In my last article I used a Monte Carlo algorithm to try and predict how the standings within the Pacific Division will likely look at the end of the season. This Monte Carlo is based on data and information we know about teams as they are today. Today we will move on to the Central division, which is looking to be the powerhouse of the NHL this year, and see what the likelihood of each team’s rankings within their division are. 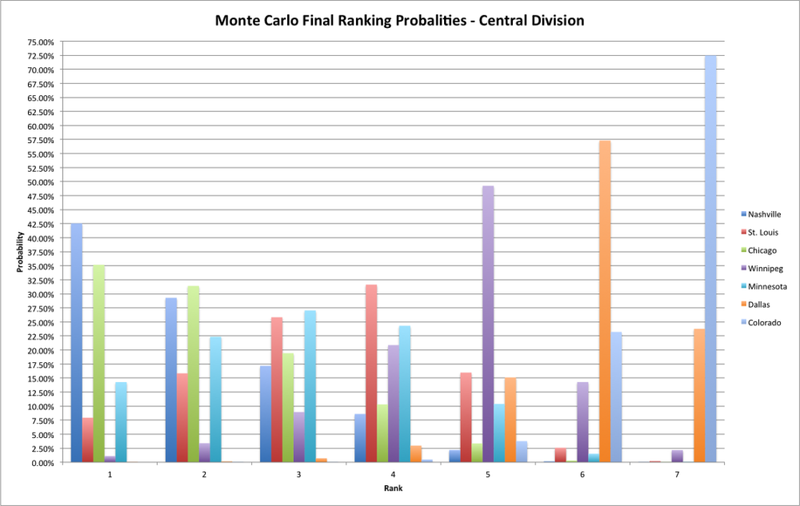 As a reminder, the Monte Carlo uses Score-Adjusted Corsi, to model the strengths of each team, research from my thesis, and random numbers to iterate over the remaining schedule over 10,000 times to come up with the probabilities. This information is based on what we know about the teams and major change ups, such as injuries, trades, and a high/low PDO run, can affect the final results. Without further ado, let’s look at our Central Division predictions. The Nashville Predators have come into the season surprising everybody. The Predators are currently sitting at 3rd in the league in Score-Adjusted Corsi (SAC) at 53.8%, and despite two other Central Division teams sitting ahead of them, they have vaulted to the top of the division with 34 points in 23 games. This is largely because of their league high PDO currently at 102.9% thanks to a .946 save-percentage which is very likely to regress. That being said their early season success will most likely win them the division title. The Blues have started off the year with slightly disappointing results as many fans were predicting dominance from this team. Rather the Blue’s SAC is currently at 11th place in the league with 51.9% thanks to excellent goaltender (.939) resulting in an above average PDO (101.0%). Their shooting percentage should see some upwards regression so the Blues should not be too worried but given how strong the other teams are it is likely St. Louis will fall to fourth place and earn a wildcard entry. The Chicago Blackhawks have started the year, to no surprise, at the top of the possession rankings controlling 56.9% of events at evens. Their current third place division rankings, with 31 points in 24 games, are mostly a result of not receiving any of the benefits of puck luck. Their PDO is average but the production coming out of Nashville will make it hard for the Blackhawks to jump to first place. Look for them to most likely earn second in the division. Winnipeg Jets fans are still waiting for their teams’ first ever entry into the playoffs and it is hard to say if this is finally the year. Winnipeg is an above average possession team currently at 12th in the league at 51.7%. Their PDO has been very unlucky, sitting down at 23rd with at 98.9%. Many would be quick to point out that it is their goaltender that is hurting them surprisingly the Jets are posting a .932 at evens, rather it is their shooting percentage, at 5.65% which is hurting them and is bound to see some massive improvement. Ondrej Pavelec has been excellent this year which is making some, including myself, question if that is sustainable. The Winnipeg Jets will likely finish in 5th in the division but given the strength of the central it looks like the Jets currently have a 75% chance of making the playoffs by grabbing the second Western Conference wildcard position. Back in 2011-2012 many people had pointed to the underlying numbers of the Minnesota Wild showing they would collapse, and they did. This year it is the opposite scenario as the Minnesota Wild are sitting at 5th in the division, with 27 points in 23 games, and the underlying numbers suggest they should see massive improvement. Their SAC is currently 2nd in the league, at 54.7%, while their PDO, currently ranked at 25th, has pulled the Wild down in the standings thanks to below average shooting and save percentages. While it would be difficult to vault those already ahead of them, by the end of the year the Wild should see an upward trend and most likely finish in third in the division. The Dallas Stars have trended in the opposite direction than many pundits have predicted. They are currently sitting in 6th in the division with 23 points in 24 games. Their possession numbers are not positive as the Stars are sitting at 20th place in the division at 49.6%. Don’t expect the Stars to move much within the standings as 6th place is their most likely final ranking. The lack of success of the Colorado Avalanche surprises very few people this year, except perhaps Adrian Dater. 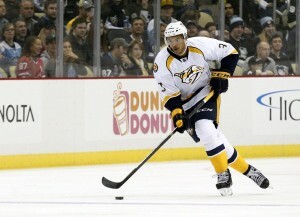 Their possession numbers are 3rd last in the league, at 44.2%, sitting only ahead of Calgary and Buffalo. The Avalanche are sitting at league average for PDO so they are not being affected (positively or negatively) by variances within shooting percentages. It would be considered a success to see Colorado finish at any rank higher than 7th within the division by the end of the year.